Ascendas Real Estate Investment Trust, Singapore’s largest industrial landlord, said distribution per unit (DPU) for the fiscal first quarter ended June will amount to 4.002 Singapore cents, a fall of 1.2 percent from a year ago due to the absence of a one-off distribution. Excluding the previous year’s one-off payment, DPU would have improved by 4.0 percent, the trust said in a filing after the close of trading on Monday. Ascendas REIT said net property income for the quarter rose 3.8 percent on-year mainly due to contributions from newly acquired properties in Australia and a redeveloped property in Singapore. Although overall portfolio occupancy rate declined to 90.5 percent from 91.5 percent in the previous quarter, Ascendas REIT managed to achieved average positive rental reversion of 10.5 percent for its multi-tenant buildings in Singapore. Ascendas REIT has total assets worth about S$10.4 billion, comprising 99 properties in Singapore and 33 properties in Australia. Supermarket operator Sheng Siong Group said on Monday its net profit for the second quarter grew 6.4 percent on-year to S$17.1 million, boosted by contribution from new stores as well as higher gross margins. Revenue for the period increased 5.7 percent to S$213.0 million, while gross profit margin rose to 27.3 percent from 26.8 percent a year ago, helped by an increase in suppliers’ rebates and better sales of fresh products that commanded higher margins. Sheng Siong plans to pay an interim dividend of 1.65 Singapore cents per share, which is an increase from the 1.55 Singapore cents per share given out a year ago. The supermarket group had 48 stores in Singapore and one in China at the end of June, up from 42 in Singapore and none in China a year before. The opening of two new stores on July 13 has since taken the number of Singapore stores to 50. Far East Hospitality Trust posted on Tuesday a 10.2 percent increase in gross revenue to S$28.5 million for the quarter ended June. Net property income was 11.2 percent higher at S$25.7 million, while distribution per stapled security for the quarter was 4.1 percent higher at 1.01 Singapore cents as an improved performance by its hotels offset comparatively softer demand for serviced residences. Far East Hospitality Trust said the operating environment for hotels in Singapore is showing signs of stabilisation, with the supply of rooms projected to rise by a more moderately 1.2 percent this year, following strong increases in recent years. Mapletree North Asia Commercial Trust (MNACT) will pay a higher distribution per unit (DPU) of 1.881 Singapore cents for the fiscal first quarter ended June as higher rents from its properties in China and Hong Kong offset a weaker Hong Kong dollar, an increase of 1.6 percent from a year ago. Gross revenue rose by a higher 6.3 percent to S$94.4 million, thanks to contributions from a portfolio of Japanese properties that were purchased in May 2018. However, the investor base also increased due to a placement of 312 million new units in April to finance the acquisition, MNACT said in a filing after the market closed on Monday. Looking ahead, MNACT said the continued stable performance of its three older assets, augmented by the new contributions from the Japan properties, is expected to provide steady DPU growth for unitholders. 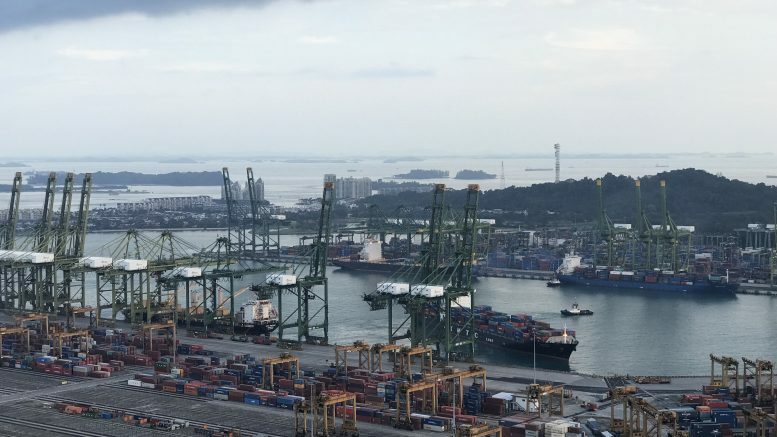 Cache Logistics Trust will pay a lower distribution per unit (DPU) of 1.419 Singapore cents for the quarter ended June, which is a decline of 17.6 percent from a year ago. The trust was bullish about the outlook, citing consultancy JLL which said warehouse rents and capital values may see a turnaround by year-end, barring unforeseen external shocks. JLL said gross rents and capital values for warehouses were unchanged for the third straight quarter in the April-June period, following 10 consecutive quarterly declines. Singapore-listed Indonesia agri-food company Japfa Ltd saw a turnaround in the quarter ended June as net profit came in at US$29.6 million compared with a net loss of US$3.4 million a year ago. Revenue increased 14 percent to US$901 million, helped by higher sales and improved margins in its Indonesia animal protein business and a recovery in Vietnam, the company said in a statement after the market closed on Monday.